For more than 20 years, DEMDACO has designed and sold giftable products intended to "Lift the Spirit"-in times of celebration, when comfort is needed, or just to put a smile on someone's face. The hand-curated artisan gifts it develops and distributes are chosen for their potential to help people nurture goodness in the lives of others, celebrate family and friends, and encourage people to treat themselves. We partner with artists representing a wide range of styles and mediums, and whose work is consistent with our values. Products are curated through this filter, then carefully reproduced by skilled craftspeople around the world. Under the DEMDACO brand, product categories include Gifts, Home Décor, Entertaining, Fashion, Baby, Holiday, and Outdoors. DEMDACO also maintains a partnership with artist Susan Lordi, offering her popular Willow Tree sculptures. Looking Back Owl Platter skillfully portrays nature's might wildlife in a life-like, energetic form that captures the eye. Makes a wonderful gift for anyone who loves animals and fine art. Dish is made of stoneware with metal handles. Hand wash only, not intended for microwave use. Tray measures approximately 15 x 8 inches. Perfect for an inspirational display or use in the kitchen. Perfect gift for housewarming, wedding, or bridal shower. Ships in protective packaging. Oregon artist Dean Crouser portrays nature's mighty wildlife in life-like, energetic form through his vibrant and intricate watercolor paintings. 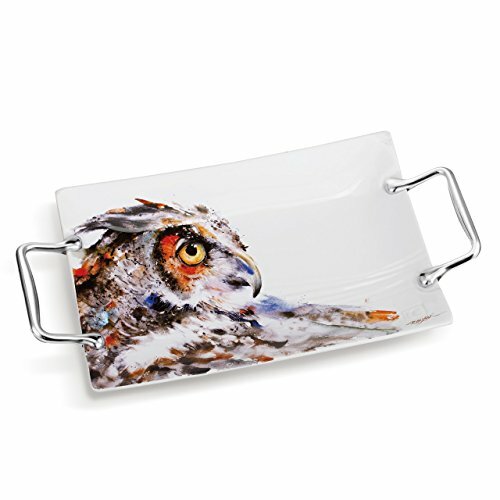 Looking Back Owl Platter skillfully portrays nature's might wildlife in a life-like, energetic form that captures the eye. Makes a wonderful gift for anyone who loves animals and fine art. Dish is made of stoneware with metal handles. Hand wash only, not intended for microwave use. Tray measures approximately 15 x 8 inches. Perfect for an inspirational display or use in the kitchen. Perfect gift for housewarming, wedding, or bridal shower. Ships in protective packaging. If you have any questions about this product by Dean Crouser Collection, contact us by completing and submitting the form below. If you are looking for a specif part number, please include it with your message.